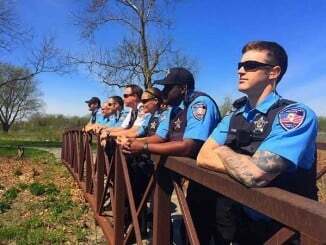 Park Forest, IL-(ENEWSPF)- Park Forest Police took the unusual move last week of addressing police shootings with a demographic that otherwise might be on the cusp of trusting police the least. A group of eight grade students from the Michelle Obama School of Technology and the Arts and two officers from the PFPD gathered for a screening of The Hate U Give, a highly rated film currently playing in theaters. According to a 2016 study by the PEW Research Center, Blacks are about half as likely as whites to have a positive view of the job their local police are doing. With a high population of African American students, this outreach between the Park Forest Police Department and students of School District 163 is especially important. Deputy Chief Brian Rzyski and Sergeant Julius Moore joined the eighth-graders for the film followed by a panel discussion of the issues raised by the movie. It’s one thing to say Black Lives Matter, it’s another to live it. And that’s the test facing Starr Carter (Amandla Stenberg), a 16-year-old African-American girl who finds it easier to ignore the race crimes transpiring in her low-income neighborhood by attending a private, mostly white prep school across town. Starr’s mother (the reliably stellar Regina King) thinks of the school as a way out for her children. But Starr instinctively knows she’s living a lie. She keeps her white boyfriend, Chris (K.J. Apa of Riverdale), a secret from her family and her family away from him, scrupulously code-switching by playing it straight down the middle while her white classmates talk “black” to sound cool. It is impossible to over-praise Stenberg’s incandescent performance, a gathering storm that grows in ferocity and feeling with each scene. Stenberg nails every nuance of a role that keeps throwing challenges at her, none more devastating than when it becomes impossible for Starr to remain stuck in neutral. The catalyst for change comes when her friend Khalil (Algee Smith) is fatally shot by a white police officer (Drew Starkey) who mistakes Khalil’s hairbrush for a gun. Starr witnesses the whole thing and finds herself at a crossroads. In a flashback at the top of the film, Tillman shows us the Carter family having the “talk.” In a concise summary of the Black Panther’s Ten-Point program, Starr’s father Maverick (the outstanding Russell Hornsby), a reformed drug dealer, tells the young Starr and her brothers about dealing with police. The crux of it is to cooperate, stay calm and always keep your hands where they can see them. The implication is: don’t rock the boat. But it is precisely Starr’s burgeoning activism that makes The Hate U Give an emotional powerhouse. The movie is based on the 2017 young-adult bestseller by Angie Thomas. “We thank Michelle Obama School for giving us the opportunity to participate in this important conversation,” police said. We commend the Park Forest Police Department for spending such quality time with the young people of our community. We commend our youth for honestly sharing their concerns with police. This is a crucial, critical dialogue.